The word 'garam' means hot and 'masala' means a spice mix. However, the only hot spice in it is black pepper. Rest are a few strongly aromatic spices. The word hot here is used for strong aromatic, as well as slightly hot. Garam masala is used to add flavour to many Indian dishes, not heat. If the spices of garam masala are used whole, they are usually added to the hot oil/ghee at the beginning, along with cumin or similar seeds used for tempering. For most recipes, garam masala is added as a ground mix, at or towards the end of the cooking process. Once a dish is ready, the heat is turned off and the garam masala is sprinkled on top. The lid is then closed and it is left to infuse the dish with its lovely aroma. This garam masala recipe is based upon how I saw my mother making it. The exact amount of each individual spice in the mix can vary from family to family. My home made version is quite strong and aromatic. If you are using this one, please note that I use less quantity of garam masala in my recipes than generally recommended, because mine is quite intense and fresh. Ready-made garam masala is often 'filled' with large amounts of cumin and/or coriander seed powder to increase the bulk. This makes the flavour less marked. You need to use more of this than I have given in my recipes. 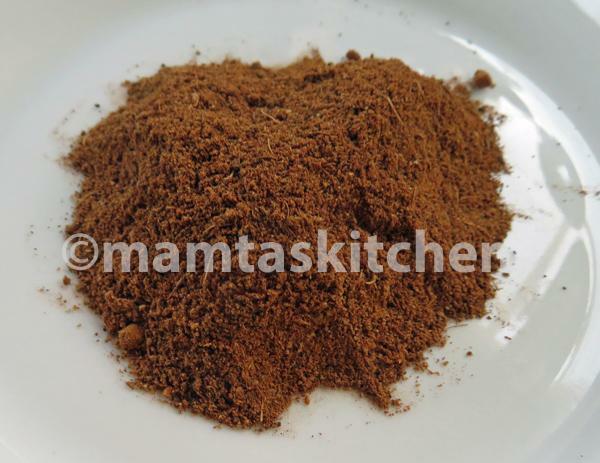 Garam masala is so easy to make, hardly worth buying the ready-made one! Also see Kashmiri Garam Masala and Curry Powder. Note: I am often asked why I don't 'roast' the whole spices before grinding them. My reason is this; my mum and others in my family do not roast them either, the reason being that when you roast the whole spices, they release their lovely aromas. If you are using them straight away, this is fine. But when you store them for any length of time, all that aroma is lost. Remember that in most instances garam masala is sprinkled on top of a hot dish, which is enough to release flavours. If you use garam masala frequently, you can make larger quantities. However, the aroma is lost over a period of time, so it is better to make small amounts, frequently. You can take a small amount out in a spice jar and keep the rest in an airtight container in a freezer. This will help to preserve the flavour for longer. 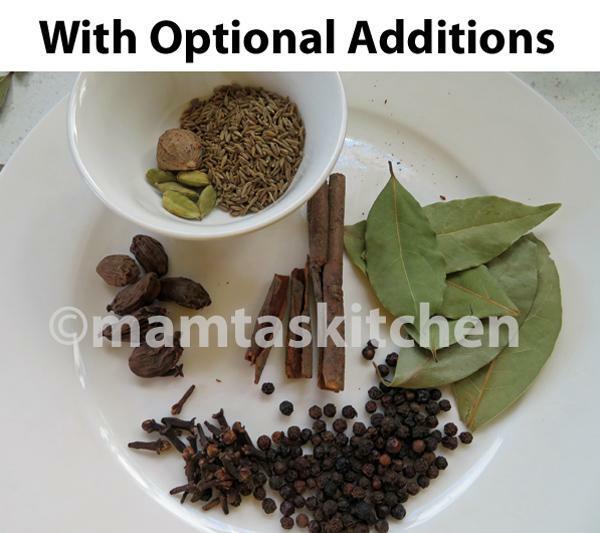 If you cook Indian food regularly and grind your own spices, it is worth investing in a small coffee grinder, kept separate just for grinding spices. 3 inch cinnamon stick((dal-chini), small pieces. In India, most people actually use cassia bark instead of cinnamon. Grind all ingredients together finely, sieve to remove any husks/fibre. Grind the fibrous material a couple more times, sieving each time to extract more garam masala from it. In the end, only a small amount of fiber is left, which can be thrown away.